to Be Opened Here Tonight. Kansas City's first Yiddish theater will be opened tonight in the Hippodrome annex, Twelfth and Charlotte streets. Manager Jacobs has fitted up a snug home for Yiddish drama here, the annex being cut off entirely from the Hippodrome proper by an outside entrance, though there is, of course, an entrance from the inside as well. M. B. Samuylow, who was seen here at the Shubert this season, will head a strong Yiddish company playing "Kol Nidre," a four-act opera with book by Charansky and music by Friedsel. Other Yiddish companies will be seen here from time to time and it is hoped to make the Hippodrome Annex theater the home of permanent Yiddish attractions, as there is a large clientele from which to draw. at 6 O'clock Last Night. The Jewish citizens of Kansas City have been fasting and praying since 6 o'clock last night. They are observing Yom Kippur, or the day of atonement, and their fast and prayers will continue until 6 o'clock tonight. Services appropriate to the event were held in all the Jewish churches last night. The services at the church of Dr. Max Lieberman, 1415 Troost, were especially solemn and impressive and they will be resumed at 7 o'clock this morning and continue throughout the day. The male choir of twelve voices sang several selections at last night's services. anah at Sundown Last Night. At sundown last night the Jewish New Year, Rosh Hashanah, began. In Jewish chronology it marks the beginning of the year 5670 since the creation. In orthodox Jewish churches the new year is celebrated two days. Services were held at sundown last night and again later in the synagogues. Services also are scheduled for this morning, at sundown this evening and tonight. In the orthodox churches the ceremonies will be repeated at sundown this evening, tonight and tomorrow morning. The two days are marked with prayer and fasting. NEW YORK, Sept. 10. -- Cupid mocked religion and nationality, as well as the parental objection, when Leon Cohen of Long Island wed Miss Myrtle Rhoads, the pretty 22-year-old daughter of Mrs. Hulda C. Rhoads. The young couple eloped, were married and left tonight for Kansas City, their future home. The parental objection to a Jew could not be overcome, so Miss Myrtle decided to run away. She is a member of St. Ann's Catholic church and a talented musician. Young Cohen is 28 years old and a member of the clothing firm of Cohen & Son of Sayville, L. I. He expects to establish a business in Kansas City. Changes in the conditions which now prevail at the workhouse are to be instituted as soon as possible, if the ideas of the members of the pardon and parole board are carried out. At the meeting of the board yesterday afternoon it was decided to send Cornelius Murphy, new superintendent of the workhouse, and L. A. Halbert, secretary of the board, to Chicago, where they are to make an exhaustive study of the conditions which are in force at that institution. It was deplored by the board that there is no means of teaching a prisoner at the workhouse any trade by which he might make his living if he were released or pardoned. Such institutions as laundires, shoe shops and tailoring shops were mintioned as among the available ones which might readity be had in the Kansas City workhouse. Mr. Murray and Br. Halbert probably will leave for Chicago some time during the last part of next week. William Volker and Jacob Billikopf, members of the board, both have examined the Chicago workhouse and express much appreciation of its methods. Rabbi Isidore Koplowitz of the Keneseth Israel synagogue, Fifteenth and Troost, is the author of a learned and interesting volume just published by the Franklin Hudson Publishing company of this city, under the title: "Al-Moveth" or "Immortality of the Soul." This is the fifth volume from the pen of Dr. Koplowitz, who was formerly a lecturer at the state university of Georgia and is a scholar of wide attainments. He has been here for the past four years and has taken high rank in Jewish circles. In his latest book, which is a modest little volume of attractive typopgraphy, Dr. Koplowitz examines exhaustively the whole problem of the soul's immortality. The book is designed as a protest against the prevailing materialism of the day and as a battle cry and slogan in the assault upon this dangerous and insidious tendency. The author's profound scholarship and extensive research are shown in the aptness and variety of the quotations used in support of his argument for immortality, which, he declares, is demonstrable by reason, logic and science. The answer to Job's question "If a man die shall he live again," is a triumphant affirmative. A Jewish policeman, the first Kansas City ever had, arrested an Irishman last night for disturbing the officer's peace. 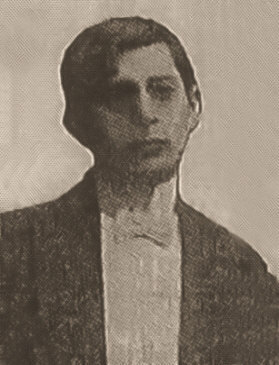 Max Joffy, formerly a porter in James Pendergast's saloon and later a janitor at the city hall under Mayor Henry M. Beardsley, was appointed a probationary patrolman on the police force yesterday morning along with forty-three other men. Proudly wearing his new star and swinging a white ash club he entered the drug store of Morton Burger at Independence avenue and Cherry street yesterday afternoon. Frank O. Donnely, paymaster in the city auditor's office, was in the drug store. Knowing Joffy for years he was amused at the Jewish policeman's outfit and burst out laughing. "Holy St. Patrick, look at the new cop," laughed Donnely, making a grimace, "Oh, you kid!" "I'll teach you to talk that way to an officer. Come on down to the station." Donnelly rose from the fountain, where he was drinking an ice cream soda, with a glass holder in his hand. Joffy drew his revolver, afterwards found to be unloaded, and with the tags still upon it. Donnelly's Irish spirit ebbed and he submitted. He was taken to the central police station where he was booked for disturbing the peace. He afterward gave bond. "I know nothing of the merits of the case against Donnelly," said Captain Walter Whitsett last night, "but I do know that a police officer's peace cannot be disturbed, according to the law as it is interpreted by the courts." Donnelly is a rising young Democratic politician in the Sixth ward. He has been paymaster in the city auditor's office for three years. He lives with his family at 632 Troost avenue. "I couldn't resist the temptation to have a little fun at Joffy's expense," he said. "I have known the man for five years and had never seen him take offense at a well meant joke before. This is the first time I was ever arrested in my life." The list of forty-three officers appointed by the board yesterday bears only one Irish name -- that of Daniel R. McGuire, who was made a jailer. There are such cognomens as Obrecht, Zinn, Mertz, Baer, Niemier and Siegfried. They were given clubs, stars and revolvers yesterday afternoon and will be assigned for duty today. Joffy was not on duty at the time his first arrest was made. He is the first policeman of Jewish descent to be appointed in the city, according to men who have been on the force for many years. BATH COSTS A NICKEL NOW. tive Luxury in McClure Flats. They're bathing less in the McClure flats. Private bathtubs have always been an unknown luxury there. Personal ablutions formerly were performed by most of the residents at the bathhouse provided by the United Jewish Charities at 1820 Locust street. There a child could get a bath, including the use of a towel, for the sum of one penny. An adult might bathe for a nickel. More aristocratic people went to a private bathhouse at 310 East Nineteenth street, where children paid a nickel and grown ups 15 cents. Each of the bathhouses had five tubs, but only the penny shop was ever crowded, for there are few in the neighborhood that can afford to pay a nickel to have their children washed. Since the opening of the beautiful new Jewish charities building on Admiral boulevard, the bathhouse on Locust street has passed into private ownership. Free baths are furnished at the new charities building, but it is very far from McClure flats. With the passing of communal ownership of the bathhouse passed the penny baths, and now the price is a nickel for every child, and 15 cents for adults. Therefore is McClure flats abstaining from baths, and is likely to partake of them sparingly until the completion of the free public bathhouse in Holmes square. Yesterday afternoon a member of the park board stated that it would be August 1 at t he earliest before the bathhouse at Holmes square is completed. Work has been delayed from unavoidable reasons. "A few of the children more strongly imbued with the gospel of cleanliness than others make an occasional pilgrimage to the bathhouse on the Paseo when it is warm," said Mrs. J. T. Chafin, wife of the head resident at the Franklin institute. "But for most of them the walk is too long, and many who need the bath most are too young to march such a distance." In the McClure flats district there are not half a dozen private bathtubs. An investigating committee last summer estimated that there were approximately 10,000 people in the city who had not the use of a bathtub. When Count Alexis Rojostzensky entered the room at the Loretta academy yesterday afternoon, all eyes were fixed upon him. Then there was a rush of 250 women to get in line to meet the "count." Frank Walsh, lawyer, diplomat and charity worker, stopped the stampede with uplifted hand and, in a brief speech, gave the company a general introduction. The "count" talked affably in Russianized English. His hostesses were charmed with every detail of his person, especially when he explained that he was in this country looking for a wife. A remarkable thing about the "count" which struck several visitors was that if it were not fir a monocle which he wore he would be the exact double of Jacob Billikopf, chairman of the United Jewish Charities, who is of Russian parentage and is always willing to help a religious denomination in the cause of charity. RUSSIAN COUNT TO SERVE TEA. There will be a real live Russian count in charge of the serving of Russian tea in the Japanese booth this afternoon at the May Day festival at the Loretta academy, which is to be given by the alumnae of the school. The festivities will begin at 3 and will be opened with a May pole dance given by the youngest scholars in the academy. From the minute the dance is in progress until 8 o'clock this evening there will be something doing for the entertainment of the alumnae and also for the undergraduates. Four May pole dances will be given, two by the little ones and two by the girls in the upper classes. An orchestra will furnish the music and the various booths, in charge of a chaperon and attended by numerous pretty girls, will be some of the other attractions. The women in charge of the entertainment are very proud of the fact that a Russian count, who is in the city, has kindly volunteered to present and assist in the serving of Russian tea. The tea is to be brewed in a samovar and the presence of Count Rolanskyvitch of St. Petersburg will add a tinge of realism to the booth. He will be introduced by Jacob Billikopf. The various booths will be the Dutch, Colonial, Candy, Magic Well, Wayside Inn, Japanese, Handkerchief, the Married booth and the one presided over by three of the prettiest girls recently graduated and who will tell fortunes of all comers. The candy booth will be conducted by the girls of 1909 and the girls of the class of 1911 will rule over the Magic Well. 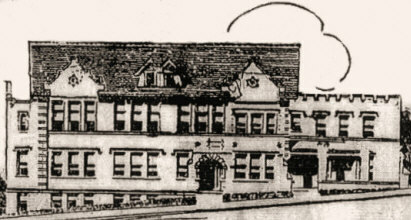 Spurred on by a desire to better the condition of the Jewish emigrant to this country and this city, the Jewish educational institute was organized six years ago and occupied a small building at 812 East Fifteenth street. After the fourth year of its existence the officers in charge decided to make it more of a power among the Jewish communities of Kansas City. To this end the late home of the institution, 1702 Locust street, was secured and the work was taken up with renewed vigor. During the past two years the utility of the institute has been demonstrated by its growth in popularity and the number of Jews who have attended the night school. The consequence of this growth was that the institute outgrew its home. The handsome new building, at Admiral boulevard and Harrison street, is constructed of vitrified brick and is three stories in height. In the basement of the building is located a gymnasium and bath rooms for both men and women. The second floor will be given over to educational work of all kinds. Chief among the educational branches is the class in English for those who have recently come to America, and classes in civil government will be given special attention. Besides these classes, manual training, such as cooking and sewing, is to be established for the women. The new building will contain a library composed of good fiction and reference books. The top floor is given over to a large auditorium in which weekly lectures are to be held for the patrons of the institute. This room will also be used for social events as well. The day nursery department will be one of the most praiseworthy features of the institute, and there the children of the women who are forced to work for a livelihood will be cared for during working hours. Before an audience that filled the auditorium last night, Dr. Emil G. Hirsch of Chicago, in his dedicatory lecture, spoke on the duties of society. "We are what we are through others," said he. "What little charity we give by no means measures what we owe. The property which you own has increased in value through no effort of yours. Its situation and mainly the incoming population has made it increase. You have not so much as touched a spade to it. This is Socialism, but what of it? "Under Jewish law, land belonged to God, and no man had a right to the same property more than fifty years. Man, today, holds his possession in a title to which society is a determining element. Since you receive great returns from society you must give something to society.
" 'Am I my brother's keeper?' questioned the first murderer. That is indeed a murderer's question. Society is never better than the worst in society. We are our brother's keeper. Insane and evil are individual and perpetual elements, but society is responsible with the individual for the blood spilled and the sighs which are winged to heaven. "As we keep our brother, in that manner shall we improve or degrade society." From the question of general society Rabbi Hirsch turned to the matter of the discrimination against the Jews as a class. "It is the greatest insult when one approaches a Jew and tells him that since he looks so little like a Jew he will be welcomed into a certain sect. I tell the man who utters such insults that I am better than he.. In the University clubs throughout the country, Jews are barred for no other reason. When I pass the University club in Chicago, I feel that I should pass on to Lincoln park and stand before the monkey cage. "There no monkey holds his tail a little higher because it happens to be a little longer than any of the others, and I can derive more benefit by watching the monkeys. This veneer of culture is sickening, and it shows the lack of true refinement under the surface. "Let the leanest of us Jews be mightier than the mightiest of them; let the weakest of us be stronger than the strongest of them. We are our brother's keeper and by them shall we be judged." At the beginning of the dedicatory services and after the building had been accepted from A. Rothenberg of the building committee by Alfred Benjamin, president of the United Jewish Charities, Mr. Benjamin was presented with a loving cup form the Jewish population of Kansas City. For the past five years Mr. Benjamin has been the president of the organization and it was to express their appreciation of his services that the people presented him with a token of their esteem. The opening prayer was delivered by Rabbi L. Koplowitz of the orthodox church and the benediction was pronounced by Rabbi H . H. Mayer of the reformed church. Final arrangements have been made for the dedication of the new Jewish educational building, located on Admiral boulevard at Harrison street. The dedicatory services will be held April 21 and 22. Owing to the lack of room in the auditorium of the new building the services on the night of April 21 will be held in the Temple on Linwood boulevard at Flora avenue. The programme for the first services ill consist of an address by Rabbi H. H. Meyer and a sermon by Dr. E. G. Hirsch of Chicago. Dr. Hirsch's topic will be "Jewish Opportunities." On the following day the services are to be held in the new institute building. Rev. Isadore Koplewitz will give the dedicatory prayer. He will be followed by A. Rothenberg, chairman of the building committee, who is to deliver the institution to Albert Benjamin, president of the Jewish charities, for its dedicated purposes. Dr. Hirsch and Rabbi Meyer will deliver addresses. AND PRAY FOR SEVEN DAYS. At sunset yesterday evening the orthodox Jews of Kansas City sat down to the tables in their respective homes to observe the anniversary of the "Feast of the Passover," a custom followed in Jewish homes for more than thirty centuries, conducted in accordance with the command as set forth in the twelfth chapter of Exodus and after the manner of the feast immortalized nineteen centuries ago when Christ and his disciples partook of the "Last Supper." The Feast of Passover is a celebration in remembrance of the exodus of the Jews from Egypt. It symbolizes their freedom form the oppression of those old days. The ceremony lasts seven days, beginning at sundown on the Monday preceding Easter Sunday and ending at sundown on Easter day. The feast which begins at sundown is called the "seter" and is observed the first and second days of the Passover. At this time all of the good things in the Jewish culinary category are brought to the table. The supper is preceded, anteceded and interspersed with prayers which, according to custom, recall the slavery days in Egypt. The unleavened bread and wine of the Christian communion are a part of the ceremony of this feast. According to the ancient Jewish calendar the days began and ended with the sinking of the sun and all rites and feasts commenced just as the sun disappeared below the horizon. During the entire seven days the Jews eat only unleavened bread. At 10 o'clock this morning services will be held at Bnai Judah temple, Flora avenue and Linwood boulevard, when Rabbi Harry H. Mayer will preach the sermon, taking for his subject "The Festive Symbols." The Festive Symbols, as explained by Rev. Mayer, are the egg, which symbolizes immortality and the rebirth of year or spring, according to the ancient Jewish folk lore; bitter herbs, the reminder of the servitude and oppression of the Jews in Egypt and the unleavened bread, symbolizing the hurried departure of the Jews from the hated country, they having had not time to put leavening in the bread for the feast. The first and last days of the Passover are holy days. Services will begin at Keneseth Israel temple, 1425 Locust street, at 8:30 o'clock this morning and will continue until noon, Rabbi Max Lieberman presiding. To divert the thousands of Jews who emigrate each year from teh section of Europe where they are oppressed to Palestine instead of the United States and South America, is the object of the society which Leon Chasanowich, a Jewish journalist and lecturer, who addressed Kansas City Jews last night at the Jewish Educational institute, represents. The organization is called the Jewish Workmen's Zion Society. It was founded recently and an active campaign for the realization of its purposes is being made. "While the Jews have fared very well in the United States," Mr. Chasanowich said last night, "a greater future awaits them in Palestine, where they can band together and make a cou ntry of their own. In this country the Jews have never been able to engage in a certain few trades and the progress of the race has suffered." Mr. Chasanowich was, until a few moths ago, the editor of two Jewish journals in Austria. He will remain in Kansas City next week, giving lectures Sunday, Monday and Tuesday evenings. From here he will go to the Argentine Republic. LOAN MONEY TO THE POOR. In order to aid the deserving poor who have to make occasional loans, the Society of Gemilus Chasodim, an organization composed of Jewish women, a scheme for lending money without security or interest has been evolved. The annual report made by the treasurer, L. J. Cohen, shows that the society has made loans aggregating $5,025, during the past year. The losses from non-payment by borrowers has amounted to less than 1 per cent of the whole. Under ordinary circumstances the loan is paid back in weekly installments of $1, but if the borrower is unable to meet the payment a longer time is given. The total funds for the organization during the past fiscal year were $5,772.60. A balance of $694.56 is left on deposit in the Fidelity Trust Company. Frank Maynard Howe of the firm Howe & Hoit, an architect of international note whose name is associated with some of the most important buildings in Kansas city, died at his home, 1707 Jefferson street, at 7:30 o'clock last night of heart disease. Mr. Howe, who was 59 years old, had been quite ill since June last. On July 6, accompanied by Mrs. Howe and their daughter, Miss Dorothy Howe, he toured Great Britain, Holland, Germany and France, in the hope of recovering his failing health, but when he returned October 7 he was but little improved. Besides the widow, Mrs. Mary E. Howe, and the daughter, Miss Dorothy, there is another daughter, Mrs. Katherine Howe Munger, who lives at the family home. There is one grandchild, Nancy Munger, 3 years old. When Mr. Howe came to Kansas City in 1885, the architectural firm of Van Brunt & Howe was established, in connection with a similar firm in Boston, Mass. Several years later Mr. Van Brunt came here. At the death of Mr. Van Brunt, seven years ago, the firm of Howe & Hoit was organized. Mr. Howe was the architect of some of very prominent buildings, among them the Electricity building at the Columbian exposition, Chicago, in 1893, where he was also a member of the board of consulting architects. He held a similar position at the Louisiana Purchase exposition in St. Louis in 1904. Among Mr. Howe's first works was the Union station at Worcester, Mass. He was born in West Cambridge, Mass., now known as Arlington, and was a graduate of the Massachusetts Institute of Technology. Some of the well-known home buildings of which Howe was an architect were the following: R. A. Long building, Emery, Bird, Thayer Dry Goods Company store, Fidelity Trust Company, United States and Mexican Trust Company, Reliance building, Scottish Rite temple and St. Mary's hospital. Among the houses of worship he planned were the new Jewish temple, the Independence Boulevard Christian church and he was building the Linwood Boulevard Christian church. He also planned the homes of Kirk Armour, Mrs. F. B. Armour and Charles Campbell. When Mr. Howe died he was planning to build for R. A. Long a $1,000,000 home at Independence and Gladstone boulevards, which with stables, conservatory and other buildings, will occupy a full block. Mr. Howe was a member of the Elm Ridge Club and the Knife and Fork Club, and was president of the Philharmonic Society throughout its existence. As a great-grandson of Isaac Howe, who fought at the battle of Lexington, he was selected for membership in the Sons of the Revolution. Mr. Howe's ancestors were English Puritans and came to Massachusetts in the seventeenth century. He was a member of Ararat temple, Mystic Shrine, and a thirty-second degree Mason. His principal avocations were painting water colors and music. He played the piano and the pipe organ. The children of the B'Nai Jehudah congregation, Flora avenue and Linwood boulevard, were given a treat last night when they listened to a lecture by Alfred Foster of Australia, a traveler of note. The lecture was illustrated by stereopticon views, made from pictures taken by the lecturer in his travels, and included a trip from San Francisco through New Zealand, Tasmania, the Fiji islands and a portion of Australia. All the chief points of interest were illustrated and an entertaining description of the countries and people was given. At the conclusion of the lecture, the ladies of the Temple Sisterhood distributed boxes of candy to each child present. More than 200 children enjoyed the entertainment. Associated Charities, 1115 Charlotte street (will also distribute tickets among colored population); Institutional church, Admiral boulevard and Holmes street; Helping Hand, 408 Main street; Franklin institute, Nineteenth and McGee streets; Grace hall, 415 West Thirteenth street; Humane Society, city hall, second floor; United Jewish Charities, 1702 Locust street; Italian Charities, offices with Associated Charities; juvenile court, county court house; Bethel mission, 43 North First street, Kansas City, Kas; Catholic Ladies' Aid Society, Eighth and Cherry, St. Patrick's hall. tion in Persia Many Hundred Years. Gentiles call it the Jewish Christmas, but of course that is a paradox. It was celebrated by the Jews of Kansas City last Saturday, December 19. In many homes the celebration partook of the character of the Gentile Christmas. The children were the principal beneficiaries. One hundred and fifty of them from the Jewish Sabbath schools went to the Orpheum theater in the afternoon and there were gifts and merrymakers in the homes at night. The real name of the feast is Chanika. It is celebrated in honor of the preservation of the Jewish people from the fury of a Persian king. Haman, a hater of the Jewish race, was prime minister for the king, according to the Old Testament story. He prevailed upon the monarch to believe that the Jews were plotting against him and to send out a general order for the extermination of the race. Mordecai, the Jewish prophet, had a sister, the beautiful Ester, who was the favorite wife of the king. He told her of the plight of her people and prayed her to use all of her influence with her consort to have the order of extermination revoked. She went to her husband and under the influence of her charms and blandishments he yielded to her entreaties and the Jewish people were saved. The feast of Chanika has been kept from that day, and is many hundreds of years older than Christmas. "Nationalism and Zionism" was the subject of a masterly address by A. H. Fromenson of New York to the Jews of Kansas City at Woodman's hall, 1210 Main street, last night. Mr. Fromenson is the editor of the English edition of Tageblatt and is a Zionist of national reputation. "In no country in the world other than the United States is the Jew admitted on an equal footing with the other citizens of that country," he said. "Even here there is talk of an exclusion law which will operate principally against us. In Russia we are reduced to a condition of outlawry and in Roumania our condition is little better. In Germany and France we are oppressed not by law, but by popular opinion. Even England discriminates against us. A thousand influences are constantly at work to deprive us of our character as a race. The Jew, the scapegoat of earth, must have some place to go. "The Zionist movement attempts to find this place. We have chosen Palestine, for that is the country that was promised by God to the seed of Abraham forever, and that is the land in which took place all that is worthy of us as a nation. In alien lands we have produced Heine, Gambetta, and a host of others, but for almost two thousand years we have produced no man who has been really great as a Jew. "Palestine is a fertile country, described even in a sober consular report as a land flowing in the proverbial milk and honey. The Jewish colonization society has invested millions of dollars in lands there, consisting principally of olive and orange groves, and it hopes some day to build up there an independent country which will be a buffer state between the East and the West. "Since the bloodless revolution in Turkey we have been assured that if at any time the population of Palestine becomes Jewish in complexion that the country will be given its freedom. There are many Jewish settlements there now and the number is increasing rapidly. There is every hope that some day the Jew will no longer be a wanderer on the face of the earth, but will have a home of his own and a government to protect him when he is oppressed in foreign countries. This is no idle dream but a very probable reality." To establish a publicly secured, legally assured home in Palestine for the Jews of the world, is the object of the Federation of American Zionists. The chairman of the Zionist propaganda committee, A. H. Fromenson of New York, arrived in Kansas City yesterday. He will be here a week and will speak to the Jews of Kansas City Sunday and Monday nights at 1210 Main street under the auspices of the United Zion Society of Kansas City. "I'm not here to attempt to persuade the Jews of Kansas City to pack up and move to Palestine," said Mr. Fromenson last night. "I'm not selling anything, either. I'm simply here to explain the Zion movement and I want the Jews here to do all they can to help prepare a place in Palestine for the Jews. "The object of the movement is not to take all the Jews to Palestine. There are 13,000,000 Jews in the world, and 11,000,000 of these live in lands of persecution and oppression, discrimination and intolerance. For a great many of these 11,000,000 the only hope is in withdrawal. The Zionists don't believe the Jews have the right to thrust their burdens on the world at large. They consider it more manly to solve the problem of existence, liberty and future themselves. The Zionists say that Palestine is the logical center for the great majority of Jews, because it is the Jews' own country, and since the ages of dispersion the Jews' craving has been for return. "The present political conditions in Turkey indicate that the time is ripe to conduct the propaganda on a large scale. There are already thirty-one colonies of Jews in Palestine, all agricultural and flourishing. "My contention is that it is the American Jew, who enjoys liberty and the right to pursue happiness, who should do more than any other to help the persecuted Jew to secure that liberty which the American enjoys. "The American Jew may never go to Palestine, yet as a Jew it is incumbent upon him to make sure of a place wherein the Jew will be able to serve humanity far better than when his soul and body are in fetters." The Zionists have a business organization and are buying land in Palestine as fast as they secure the funds. They have been promised by the new Turkish government that as soon as the Jews have a majority in Palestine, they will be granted self government. Mr. Fromenson is touring the United States lecturing to the Jews. He came here from Minneapolis and will go from here to Denver. He was, until a year ago, editor of the Jewish Daily news in New York. Sitting alone in his little shoeshop at 1221 West Twenty-fourth street there is an aged, white-haired man. The police say he has no more heart for work. He stares vacantly into space and occasionally a tear drops from his furrowed cheek. The old man is Elle Bassin, father of Nathan Bassin, the young man murdered in the shop at 10 o'clock Saturday night by highwaymen. The aged man is nearly blind and depended upon his son to take the work off his hands. Now the support of the widowed daughter-in-law and her two children has fallen on him, and the burden is a heavy one. Confessed Slayer of Nathan Bassin. Confined in separate cells two young men sat in the county jail all day yesterday. It was their first day there, and no one called on them. They were Edward Cassidy, who has a home at 908 West Thirty-first street, and Thad Dyer, 703 Southwest boulevard. They are the cause of the aged shoemaker's grief. Cassidy confessed that he and Dyer went to the shop bent on robbery. They met with resistance from Nathan, the son, and Cassidy shot him dead. Dyer was guarding the door at the time. Both men say they are sorry, really sorry, that they took a human life. Accomplice of Cassidy in the Bassin Murder. Dyer's father, Edward Dyer, is a member of the fire department, and the boy had a good home, but he was wild and often fell into the hands of the police. Both boys were born and reared near the Southwest boulevard, and have known no such thing as restraint since childhood, the police say. Cassidy has an impediment in his speech that gives the impression that he is not very strong mentally. Neither boy attended school to any great extent. They are being held in the county jail without bond awaiting trial by the criminal court on an information charging them with murder in the first degree.